Choose a page number then click on the arrow buttons to hear the words. This new edition of Usborne’s best-selling language series is packed with stickers and colourful scenes from everyday life. 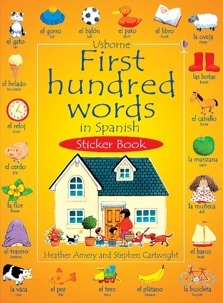 Children will love matching the words on the picture stickers to the relevant words printed along the top of each page. All stickers are reusable and there is an easy phonetic guide to pronunciation at the back. Heather Amery was born and brought up in Bath, Somerset. Heather has written over a hundred books for children, including alphabet books, science and history books, craft books, classical fairy tales, a series for beginner readers called Farmyard Tales, Bible stories, and Greek Myths. She has also compiled word books, song books, and books of poetry.